I was too chicken to give Fuzz’s teacher the cookies yesterday, but it was for the best. We found out this morning that today is the teacher’s birthday, so we now have a legitimate excuse for giving her cookies. Since the chocolate chip cookies are all gone, I started fresh. There was some Maida’s Mexican Icebox Cookie dough in the freezer, so I did another variation, this time stuffing them with Dove dark chocolates. This photo shows the dough being stuffed. And here’s a shot of the fully baked Dove stuffed cookie I’m eating right now. I hope you don’t find the flowery plate too distracting, but the light in here was nice so I decided to take a candid photo. The spicy chocolate cookies are so good. Thank you Maida Heatter, wherever you are. 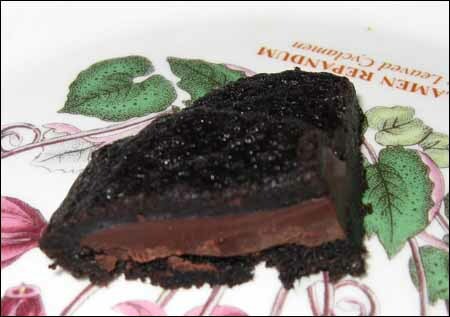 And thanks to Wolfgang Puck for this second recipe, which was sent to me by my friend, Carol. This is (kind of) Wolfgang’s recipe but with some changes. Here’s the original, should you wish to go to the source. I halved it, took out the allspice, plumped the raisins added vanilla and was less finicky with the mixing technique. The cookies still turned out great. They’re kind of middle-of-the-road, all around good oatmeal raisin cookies. Place apple juice in a microwave-safe bowl and heat for about 1 minute or until very hot. Soak raisins for 15 minutes. Drain and gingerly pat dry before using. Sift together the flour, cinnamon, baking soda, baking powder and salt. Set aside. In a large mixing bowl, using an electric mixer, beat the butter and both sugars until creamy. By hand, stir in the egg until incorporated. By hand, stir in the flour mixture, scraping side of bowl well. 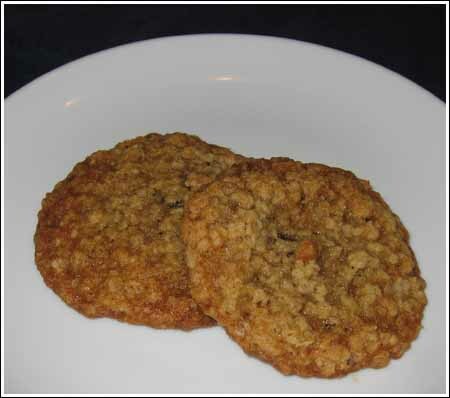 When flour mixture is incorporated, stir in the oats, drained raisins and walnuts. Position the oven rack in the center of the oven and preheat the oven to 350 degrees. Line 2 baking sheets with parchment. Form golf ball size balls and place at least 2 inches apart, on cookie sheets. Bake for 13 minutes, turning halfway through. Let cool for about 4 minutes on the cookie sheets, then transfer to a wire rack. Abi, that is something that would have been very liable to happen last week. I was having a string of failures. Thankfully, these weren’t one of them. 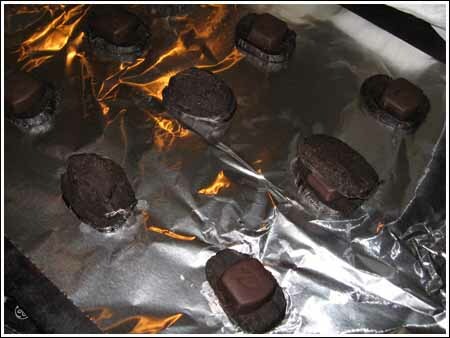 Oh man, I first saw that photo of the cookies being stuffed and thought that you’d charred them all to a crisp! I recently stuffed a pan of brownies with Dove Promises and they also came out fab! Maida Heatter sounds suspiciously like Mad Hatter. I’m going to try those hot cookies today – folks are coming for dinner (fajitas) and there is a new baby on our street. The Dairy Hollow House oatmeal cookie recipe I got from you has been my gold standard, now I might have to have a challenge! I like your version better than Wolfgang’s. I need something to take to the girls in the Dr.’s office, tomorrow. This is it.